It’s never too soon (or too late!) to get into American Football. This week we caught up with some of the players and coaches from our non-adult teams. We’re proud to be working young men from 8 years old and upwards. These guys are the future of our great club, and they’ll be the ones shaping the future of American Football in the UK. First of all, what are the differences between Adult and Non-Adult American Football in the UK? There are many different types of non-adult football for different ages, and in the Blitz Youth Program we have teams for all of them. Under 19 is kitted 9-a-side football. This is the same as adult football except you lose 2 of the Offensive Line and 2 from Defence. This is to make it easier for teams to put out teams on a regular basis as recruiting offensive lineman is traditionally more difficult. However, watching a 9-a-side Junior game wouldn’t look very different from an adult game. Under 17 is kitted 5-a-side football. This is the same concept as flag, except kitted and full contact. On offence there is a Centre, Quarterback and then 3 other skill position players who can be Receivers or Running Backs . The big difference between 5-a-side and 9-a-side is that the Centre is eligible to catch a pass from the Quarterback, which is different from Under 19 or Adult football. Flag Football is non contact and the tackle is made by grabbing the flag from the ball carriers hip. We have 2 flag teams, a Cadet flag team for ages 8-12 and a Junior Flag team for ages 13-17. Both play with the same 5-a-side flag rules. Many Blitz fans won’t be familiar with our Youth Program - how have we performed in recent seasons? Our Youth Program has been very successful in recent years. Our Under 19 team have been National Champions for 4 out of the last 5 years, having 4 undefeated seasons and a total record of 52 wins and 2 losses over the last 5 years. Our Under 17 team have been perennial contenders, reaching the quarter finals once and the semi finals twice over the last five years. They have achieved a combined record over that time of 49 wins, 13 losses and 1 draw. At the Flag level we have also won national championships. Our Junior Flag team were national champions in 2011 and 2012, whilst our Cadet Flag team were national champions in 2015. A lot of younger guys in London have grown up playing football and rugby. How accessible is American Football for younger players? American Football is a very accessible sport, 99% of our players have never played the sport before they come to a training session with us. A lot of our players who join our youth squads go on to do great things. Many graduate into our adult A and B Teams, and some (e.g. Tiger Taylor-Hart and Alex Dickson - both club record holders) go on to play in the USA. What advice would you give to someone looking to take up American Football for the first time? Get involved! Come down to a training session and try it out. We are used to coaching players who have never played the sport before so you will be in excellent hands. 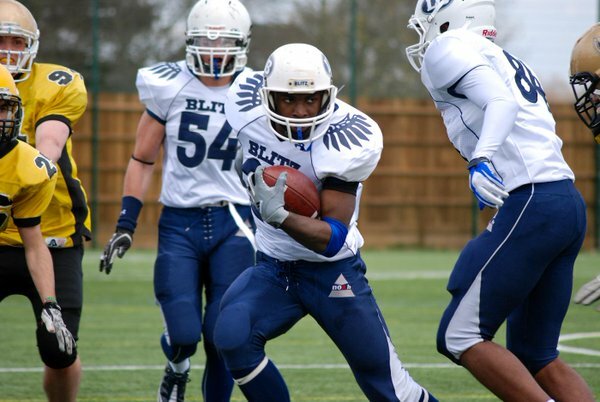 How can younger players get involved with the London Blitz for the 2016 season? Sign up to Webcollect so that you can find out when the next open session will be and get regular emails from us.